SPOTTER: At the races that are companion events with the Sprint Cup Series, Praytor will continue to utilize Pensacola native Tab Boyd. When he is not moonlighting for Praytor, Boyd is William Byron’s new spotter in the Monster Cup Series. 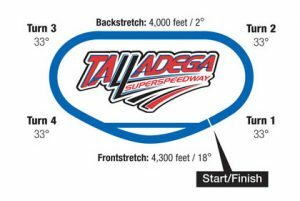 The General Tire 200 is a 2 day event starting with technical inspection Thursday. The gates open bright and early at 7 am Friday morning for an incredible day of events, starting with practice at 8:30. We will then roll into General Tire qualifying at 2:30 pm, and the green flag will drop at 5PM CST. Live timing and scoring for practice, qualifying and the race will be on ARCAracing.com. The race will be broadcast live on Fox Sports 1. Also, please follow us on Twitter (@DKLOKRacing), Instagram (Thomas Praytor), and Facebook (Dk-Lok Racing) for live trackside updates from our PR team. DK-LOK Fittings & Valves www.dklokusa.com. CAR: MF002 The team has been working on this chassis for the last 5 seasons for exclusive use at Daytona and Talladega. It’s paid off with the car and Praytor drafting to their way into the top 5 in the last 5 plate races. Expect more bold moves at Talladega. WHAT TO LOOK FOR THIS WEEKEND: The name of the game this week will go something like the Toy Story theme song “You’ve got A Friend in Me”. This week is all about strategy and partnership. Starting with group qualifying, either your group finds a friend in one another or… you’ll be in the dust. Same goes for the race, you have to find that right draft group that will stick with you until the end. The fans will be in for a ride to see who finds their “Friend until the End” or will be stuck solo. Oh and last thing.. STAY OUT OF THE BIG ONE! DK-LOK USA: Founded in 1986, DK-LOK Fittings and Valves supply industrial applications from analytical and process instrumentation, gas, power generation, petrochemical processing, ship building to semiconductor manufacturing. DK-LOK tube fittings, instrument pipe & weld fittings, and valves are manufactured to stringent industry standards. With the use of only the highest grade raw material and 1/1000″ tolerance control on each and every part, DK-LOK assures a leak-tight seal in all process, power, and instrumentation applications. DK-LOK USA is a Mobile, Alabama based firm operating nationally and internationally. THOMAS “MOOSE” PRAYTOR: In 2017 Thomas “Moose” Praytor became the ARCA Ironman or IronMoose by achieving more consecutive starts than any other active ARCA Driver. By the end of the 2017 season Praytor had extended his streak to 101 consecutive starts. In addition to having the most consecutive starts, IronMoose is the only active driver to finish in the top ten in the ARCA Championship Standings for the last five seasons. For more on the Moose- www.thomaspraytor.com. MAX FORCE RACING: Max Force Racing is based out of Mobile, Alabama and is fielding cars in its 21st season of competition. Picture: Praytor with DeKendrick Graves & Jeffrey Oliver, AIDB Students in 2017.